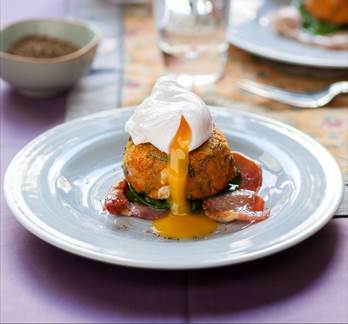 Welcome guests inside with this sophisticated sweet potato recipe for patties with grilled bacon and poached duck eggs. A dish that looks as good as it tastes, with a rich duck egg that sits elegantly atop a crunchy patty and crispy bacon, it’s sure to become the star of the party. Dust with paprika for guests who crave a touch of spice or omit the bacon for a delightful vegetarian dish. Sweet potatoes are a tasty vegetable that can be enjoyed all year round, and are also low in fat and high in fibre. They’re packed full of anti-oxidants and vitamins A and C, and count toward one of the 5 a day. The Love Sweet Potatoes campaign is designed to tell consumers about the benefits of sweet potatoes and the different ways they can be used in everyday meals. The North Carolina farming family at Scott Farms is behind the campaign and has been growing sweet potatoes for over four generations. They are now the largest importer of sweet potatoes into the UK. 1. In a large bowl combine the sweet potatoes, pepper, bok choi, smoked paprika, cumin, garlic and honey together with a little polenta flour. 2. Adjust the seasoning, split into 4 equal balls, squash them down and coat with some polenta – this will help to make them nice and crisp when cooking. 3. Place a large pan of water on the heat and bring to a gentle boil. Add the vinegar to it. Crack the eggs into 4 individual dishes, ready to be poached. 4. Shallow fry the patties for 3-4 minutes on one side. When they are ready to be turned, stir the pan of water and gently pour the eggs into it, one at the time (the water should be simmering and not boiling). 5. Cook the patties for 3-4 minutes on the second side. When they are ready, so should be the eggs. 6. Gently remove the eggs from the water and drain on some kitchen paper. 7. When you are almost ready to serve, place the bacon on a rack under the grill and cook until crispy. When cooked, remove and keep warm. 8. Place the patties onto four serving plates. Cut the bacon rashers in half and arrange four halves over each sweet potato patty. Top each with the poached eggs, drizzle with a little oil and serve. I am a big fan of sweet potatoes. Do you have a sweet potato recipe to share?